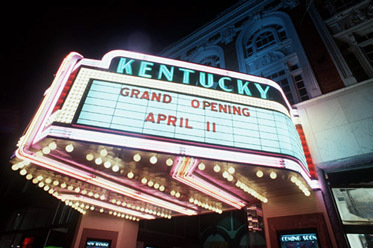 LEXINGTON, KY — I would like to let you know of a documentary about the Kentucky Theatre. The film follows the eighty year history of the theater through archival photos and interviews, the battle with suburban multiplexes as seen in news film reels, and the devastating fire which led to the theater’s closing. A love for the theatre led a group of citizens to rise up and resurrect and refurbish the theatre which is very much alive today. The film not only shows what a shining treasure the theatre is to the downtown of a small southern city, but its influence on generations of patrons, as shown throughout the film. As director of the film, it is my hope that this story can act as a model for other cities wishing to bring back their own downtown treasures. Great story, yes I also hope it catches on. Way to many have bitten the dust. So sad to see all of them gone.